Local Mums are celebrating the announcement that the immediate threat to St Helier Hospital’s A&E, maternity and children’s wards has passed, although the future for the hopsital remains uncertain. The Better Services Better Value review, which recommended the massive cuts to the hospital, has now been forced to delay going out to consultation on the plans due to NHS England's statement that the current proposals are not financially�viable. Dr David Finch, joint medical director of BSBV, said: "NHS England has asked us to look once more at the finances to give absolute assurance before the programme progresses to the next stage." 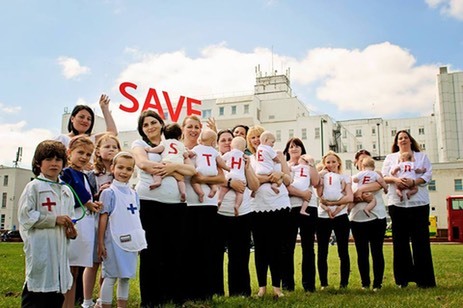 The campaign to save St Helier reached it's peak last week with Local Mums Online's follow up protest to their famous�pregnant protest outside the hospital, posing with their babies. The protest provoked widespread publicity and debate, featuring numerous times on BBC TV News and radio. Founder of Local Mums Online, Kathy McGuinness, who led the protests, welcomed the announcement, saying: “This is a victory for the thousands of people who protested against this ridiculous proposal. The whole community came together to voice their outrage and BSBV has been forced to back down in the face of such determined opposition." In May, �BSBV recommended that Epsom and St Helier hospitals should lose their A+E, Maternity and Children's services with St Helier instead becoming a centre for planned surgery across south west London. The proposals were due to go out to a three-month consultation period at the beginning of the Summer and Local Mums Online were preparing to continue the fight - but now they are looking ahead to continue their campaign if new proposals are announced in the Autumn. However, the uncertainty remains for hospital staff and patients who are still unclear about what the future holds.